Biography & Genealogy: John William Lewis, Class of 1859: Genealogy: Born- Oct. 8, 1837 at Fort Lewis, Bath Co. Va. Father- Samuel Lewis; Mother- Elizabeth Crawford. Pat. Grandfather- John Lewis; Pat. Grandmother- Rachel Miller. Mat. Grandfather- William Crawford; Mat. Grandmother- Nancy (maiden name unknown, unless it was also Crawford). Married- Laura Crewse. Children- 1- Mrs. Howard Bunch (given name unknown); 2- Sue Lewis. VMI Record: Entered VMI Sept. 4, 1855; Graduated July 4, 1859 ranking 7th in a class of 29. Military Record: Enlisted Aug. 19, 1861 and appointed Adjutant of the 52nd Va. Infantry; promoted to 1st Lieut. Dec. 2, 1861; Wounded in action at Port Republic; appointed Captain and Assistant Adjutant General Oct. 7, 1862 and ordered to Trans-Miss to report to Major Gen. T. H. Holmes; ordered to duty with Maj. Gen. T. C. Hindman's division Jan. 23, 1863 and assigned as Assistant Adjutant General to Brig. Gen. D.M. 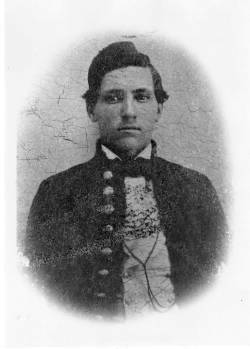 Frost; assigned to duty at Head Quarters, District of Arkansas April 4, 1863; assigned to Brig. Gen. T. F. Drayton's brigade Oct. 17, 1863 but soon back at District Head Quarters; There on staff of Maj. Generals S. Price and J. B. Magruder until assigned as Assistant Adjutant General of Price's Division March 7, 1865; Ordered back to Head Quarters March 15, 1865. No further record found. Careers: Teacher; cotton planter. Professor of Math and Tactics at VMI 1859-60; Commandant and Professor of Math, at St. John's College of Arkansas (a military academy) just before the Civil War; Cotton Planter after the war. Owned and operated his own plantation. Death: Feb. 12, 1882 in Homan, Miller Co. Ark.